We have two of those stainless steel cylindrical cans that open with a foot pedal, and they are approaching the end of their usable lives. Sadly, when we've hit Target, Home Depot, and so on, we're not seeing too many new options out there. So what's available? I'm not talking about just cans that sit on the floor but ones that slide out from under the sink or from anywhere else. What do you have? What do you want? We have dogs so it is important that they cannot get into the garbage. Ours is inside a lower cupboard, under the sink. It comes out when you open the cupboard door. Good. Takes regular size of plastic bag. Has a clip on rim which holds the bag in place. It has a lid which Ed made from a pot lid. You pick up the lid in one hand while the refuse is in the other. Can't even remember the original lid. Semi-acceptable. The bad part is in the summer. 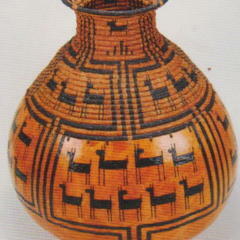 Open the door, out comes the lidded can, take off the lid...whew! Release the smell into the kitchen. That I crab about each summer. We have some SimpleHuman cans. On the plus side, these are fairly effective footpedal cans and the company actually has customer service (they sent me a new hinge, gratis, when my old one rusted away). On the minus side, they're expensive ($100 - $200), and despite the stainless steel exterior they still have plastic interiors (why won't manufacturers learn to put metal on the inside!). I've seen the SimpleHuman cans at TJMAXX or Tuesday Morning from time to time. I'm working on a house design with an L-shaped kitchen counter that has a split-level entry behind one wall. We're going to cut a 12" diameter hole in the counter at the elbow, and have an organics bin below that can be accessed from the entry. To empty the green bin, the corner cabinet opens from the back through the wall with a door 4' off the ground right by the backyard door. That was our primary design criteria, also. We installed a Rev-A-Shelf pull-out in an Ikea cabinet. 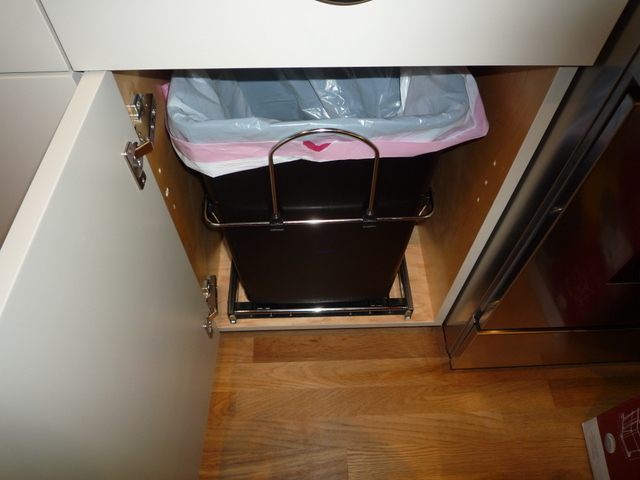 The pull-out holds two tall kitchen trash cans, one for garbage and one for recycling. Kitchen design nerds can while away many happy hours on the Rev-A-Shelf website (clicky). 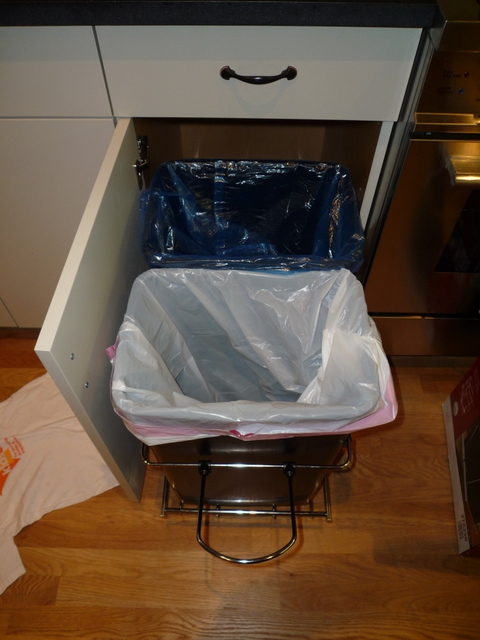 I actually have a picture of our garbage can, taken during my foodblog. Buy a suitable size plastic can that will fit behind the door on your under/ sink cabinet, jury rig a support that you can attach to the back of the door that you hang the plastic can on,also, put a small raised tab on the bottom of the door where it hangs over the outside edge so you can open the door with your foot.. I have the simple human slide out in my cabinet. It is lidless, so it can get smelly in there when you open the door if you leave food scraps in there too long, so I don't. Got it because the cats were getting into everything else I ever tried. I think it also comes in a two smaller can version, so you can use half as recycling or compost. Very sturdy, easy to install, love it. BBB and beyond has a good selection, and you have those 20% coupons, so not too pricey. I just moved into a house where the kitchen has a double under-sink slide out garbage (two cans one behind the other). We also brought our SimpleHuman can. I still prefer the Simple Human step can as it allows me to open the can when my hands are gunked up. Doesn't work so well with having to open the drawer for the other cans. They are good though for seperating recycling and keeping it out of sight. I, too, have the cat issue and they don't seem to bother with the SimpleHuman can. Hrm. This is raising serious issues. Gotta have a secure cover (we have a coonhound and I produce lots of stink). And it has to be big. C. sapidus big. No little 6"x12"x18" things under the sink will do. OR: it could be two systems. Does anyone have separate cans for (non-organic waste) trash and (organic waste) garbage? BTW, I've found that, inevitably, even stainless steel interiors start to rust over time, due to the exposure to salts and other corrosive stuff. ---our under the sink garbage can is quite big. Ed says the bags are Glad, about 10 gallons which is actually more than the can. ---- Yes. The above for non-organic and an old stock pot and lid for the organic. Plus a drawer for the plastic, cardboard, cans, etc, recycling stuff on its way to the three bins in the garage and we recycle a lot in our county in Ontario. It's all a bit much, but we do it cause we think we should do at least a small bit. We have two systems in a way. We accumulate the organic matter we use during the day in a bowl or other container and it goes out to the compost bin in the evening. Trash goes in a container made by Brabantia which opens and closes by a slight touch on the top of the lid. I suspect a large, smart dog would be able to figure out how to open it with its chin.
. . . Does anyone have separate cans for (non-organic waste) trash and (organic waste) garbage? We have tried several systems for organic waste / compostables. Initially, we kept a small container in a pull-out under our prep sink, but it was difficult to keep clean and attracted ants. Next, we used a ceramic jar on the countertop. The jar had an integral charcoal filter in the lid, which controlled odors nicely but ants eventually found the container (are you noticing a theme yet?). We did find and eliminate the ant mother-lode, so the kitchen has been blessedly ant-free for some time now (knock wood, etc). Now, we just use a bowl near the cutting board for scraps and take the scraps out to the compost bin after prep. For more elaborate meals this might entail a few trips, but the compost bins are but a short walk outside the kitchen door. Any minor inconvenience is more than repaid when we harvest compost-fed tomatoes. We have a plastic bin on one side of the cabinet under the sink for recyclables (cans, bottles, most plastics, clean paper and aluminum foil, etc. ), another on the other side for yard waste, and a very small trash bag hung on the inside of one door (I know I've posted a link to it somewhere, not too long ago, on a similar topic). We can get away with a small one because most of our "garbage" (even bones) goes into the recycle/yard waste bins. The trash bag doesn't have a lid (it had one, but I removed it) because it isn't needed. All of this somehow fits under the sink, along with the garbage disposal and various cleaning products (not home or I'd attach a photo). Both the recyclable and the yard waste bins get emptied daily into the big outside bins and the trash bag can go for days before it needs replacing. We have cats who regularly open cabinet doors, but for some reason they always leave this cabinet alone. If that were a problem, I'd install child safety latches. I wish every city would make recycling this easy! I have two of those big commercial kitchen bins (rubbermaid touchless flipper top 23 gal models), 1 in the kitchen and 1 on the porch to the garage for recyclables. I wanted something that was big enough to only need emptying once per week, The recyclables I only need do once per month. I use plastic bag liners with both. I had to get a large galvanized trash can in the garage to hold trash, if I missed the pickup or had smelly shrimp shell garbage. I live in an urban area along a river and rats are a problem. I even had to buy a small metal can to store grass seed away from little rattie teeth. Plastic trash cans in the garage or outdoors was just inviting the rats for a catered banquet. Heck, they even chewed up a neighbors plastic kayak and made a home in it. Finding the galvanized cans took numerous trips around town to locate them. Compostables go in bowl on counter, emptied every day (every meal in summer). 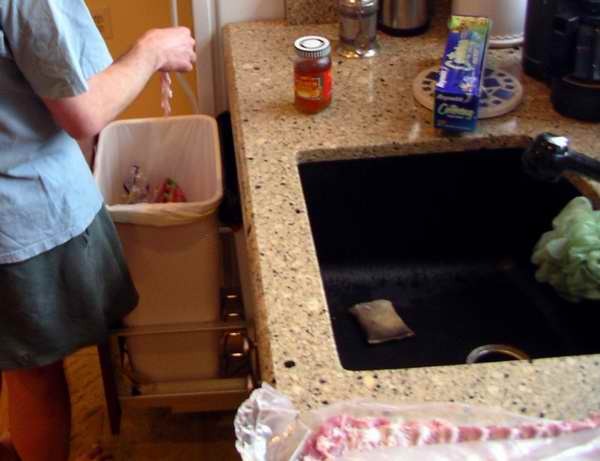 "Trash" and recyclables go in separate bins under the sink. We have a simple human can that we got at TJ Maxx. I think we paid 70 for it. We like it a lot and our dog can't get in it. We also have Simple Human paper towel and napkin holders and a simple human soap dispenser. Love all those too. I just put in this Rev-a-Shelf unit that I got from Lowe's. It has two bins, one behind the other, for trash and recycling. They are 35 quarts each and take standard tall kitchen trash bags. Posted on this topic very early...post #2...that we had similar setups and that come the summer, you may hate yours also. The door is shut: all is well. The door is opened and WHAMO the garbage smell is released into the kitchen. We did have lids on ours which also helped, but not enough. Now we have other garbage units...not because I loathed them...but because we have a new youngish pup who gets into everything and we needed a more secure lidded unit. Actually everywhere in the house now has secure lidded units. Never had a dog like this before, but then her very sad background might explain it. Good luck with yours. Maybe your garbage will smell less than ours does. That was a consideration, but I'm hoping that with the help of a waste disposer unit in the sink we won't be accumulating tons of smelly trash. We shall see. I recycle the rectangular airtight plastic snap lid buckets that kitty litter comes in for compost and cleaning out the litterbox - the contents go into separate compost piles for food garden and ornamental plants. I have a cheap plastic garbage pail under the sink for trash, which is lidless. I have a town provided lidless recycling bin on a low shelf in the pantry. I let the cats lick out the occasional take out box or food container before putting it in the trash or recycling, and rinse food that they won't eat off the items, so they don't get into the trash or recycling and it doesn't smell. I find that meat scraps and bones if broken/chopped into thumb size chunks and mixed into the vegetable scraps quickly lose their smell and varmint attracting ability and are compostable, but that's with a large ratio of plant to meat waste - I'd guess 50 or 100 to 1. We have one very much like this one. I consider it one our best buys ever. It's absolutely dog proof, easy to operate, easy to empty, and the standard kitchen trash bags fit it perfectly. Indy Rob, there is no doubt, your trash can is prettier than our trash can. However, your trash can also costs a lot more than our many trash cans which are everywhere in the house now. Plus we got them on sale. So far, so good with Kyra, the canine 'raccoon' Rottie in her quests. She will outgrow this, yes? I didn't like paying that much for a trash can, but it has held up for a few years so far and works well. It replaced a cheaper can which didn't hold up as well. For compostable things, we keep a stainless steel pail with lid on the counter next to the sink, and empty it onto the compost pile as needed. I like that I can move it next to wherever I am working and shovel scraps into it. For various reasons, including trash marauding dogs (lookin' at you Rosie-avatar-dog),and the fact my house seems to have been built on the largest ant hill in the greater Los Angeles metropolitan area, and the fact I have no cabinet space to spare to stash the darn thing, the only thing that works for me is a small, open trash can that gets taken out every night as part of the kitchen clean-up. It's the size of one of the plastic grocery bags, and that's what I use as liners. Evening routine....load dishwasher, do hand wash dishes, change doggie water, take trash out, put on hand lotion. The recycling bin is larger, and gets changed out about once a week, but those things are clean, or rinsed enough that critters, either furry or insect-oid, leave it alone. Unfortunately, it's also out in the open, but tucked in a corner, so I don't really have to stare at it.